Chester Aaron was in a WWII heavy-machine-gun platoon and helped liberate the concentration camp at Dachau. After the war, he worked as an X-ray technician and later as a lit and writing professor at St. Mary's College in Moraga. Along the way he became an expert on garlic (he raises 92 varieties from 30 countries on his Occidental ranch). He's also published 20 books. The themes of the seven stories in his latest are familiar: love and loss, old world versus new, war, death, Italian food. But the tales combine aspects of his interesting life in surprising ways. In “Winterswijk,” the sweet awkwardness of reuniting with an old flame in Holland merges with dreamlike memories of the Holocaust. In “The Female of the Species,” tragedy affects the arts of love, bird watching, and bruschetta making. I did not want these stories to end. I wish the collection were a long novel that I could settle down to read over the next few weeks...If you ever wondered what mature love looks like, read these stories. In Chester Aaron's world, even when couples separate, love lives on, in fact, sometimes it thrives, and rarely have I read about the intimate lives of couples no longer together who yet come together in friendship and respect and even, yes, a new form of passion. Links between the Old World and the New World, hard work on the land from Tuscany to California, immigration and exile. The fractures caused by the horrors of the Second World War in Europe. These are some of the themes running through these seven short stories. Chester Aaron takes us on a bittersweet journey with grace and wisdom. An author of irrepressible tenderness and passion. Like Willa Cather, with just a few words Aaron reveals a rich tapestry of people, places, textures, smells and flavors. Every page lures the reader more deeply into the story to find unexpected plot twists and wonderful prose. His characters are the essence of…Passion. Passion here does not always—how could it? —end well or happily, but these stories, even the darkest of them, are full of vitality and resilience. And joy, whether it is joy found or lost, looked-for or remembered. This book is the latest of Chester Aaron's clear-eyed love letters to life, often funny, always beguiling, moving, and true. Chester Aaron's stories will mesmerize you, haunt you, and break your heart. Here, in a handful, is evidence of a life well lived. I first met Chester Aaron over an ardent e-mail correspondence about garlic; he is an expert and a grower. I soon learned that he was actually as passionate about life and writing. These traits are admirably shown in his new book of short works about people under stress passionately observed. It seems wrong to call them short stories; they are really condensed novels—rich and rewarding. The seven stories contained here, like seven heads of rare heirloom garlic, each of a different variety, provide a special taste treat. Though rough and gnarly at first bite, compared to the standard supermarket garlic, these stories release a unique punchy flavor of truth and beauty that when taken with life, makes everything much more palatable. comment on both the good and the bad of human existence in an easy to read, smoothly flowing cadre of stories. Italian. I'd say the same about Chester Aaron. He knows Italy and he knows passion when it's about food and wine, wild thyme on the hillsides, raptors and hummingbirds, parents and children, and most of all he knows passions that bind lovers, ex-lovers, about-to-be lovers, and even about-not-to-be lovers. His stories made me smile, laugh, whoop and cry. Bravo, Chester, bravo, bravissimo. and the story rings with the mistakes and redemptions of a real family, and with the complexities of love and humanity. Because the stories in Symptoms of Terminal Passion appear to be more or less chronologically organized, we have the pleasure of vividly seeing the development of a writer whose own passions touch and enhance the reader's. Aaron is well-known as a “young adult” writer whose serious subjects always refused to condescend to his audience, and he has lately become an expert on garlic, but his books for grownups show us his liveliest wisdom and insight. From his first novel, About Us, to this new collection, we see into the passions and commitments of real people—big-hearted men and women any of us would be pleased to sit down with to share an anecdote and a bottle of good red wine. Making every word count, in each of the seven vignettes, the author takes us through the horrors of war and death to the joys of love and life. In “The Scent of Thyme” Chester Aaron opens the first of his windows on the past, inextricably entwined with the present, and reveals the agony of memory and the hope for the future. “Miwok Moon” shows emotions simmering just below the surface that burst forth with a life of their own and triumph over the past. “Thirty Minutes in Bologna” and “The Female of the Species” prove that life will not be denied, despite the cruelty of fate. And finally, in demanding and achieving his own way of life, the author demonstrates the sage definition of happiness. The words on love of great Mexican writer Octavio Paz could easily apply to Chester Aaron's short-story collection: “Passion is subject to time and its accidents: change, sickness, death. Contradictory nature destroys itself and is reborn, which is always both now and never. Therefore, all love, even the most blissful, is tragic.” In each story, the setting, especially that of northern California, plays a major role. Trees and hawks and hummingbirds weave their magic. Garlic and plums turn into preserves and bruschetta. These are stories of love, loss, and reconciliation. make his vignettes all the tastier. strokes, whispers, demands the reader's emotions be a partner, with all his and their senses in high gear, whether he's in Italy, on a ranch in northern California's redwood country, in World War II, watching the Pacific fog roll in, or touching the skin of a loved one. Much too rare these days is writing, enriched, redolent with that supreme of persona-—nature, as well as emotional and historical memory. Sometimes, the manner in which a single sentence of Aaron's can expose and reveal character, or the meaning of a moment experienced, is positively indecent. 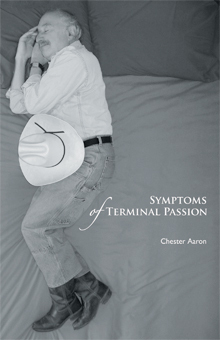 The seven short stories in Chester Aaron's Symptoms of Terminal Passion are delicate studies of a continuing search for love despite disappointment. evocations of landscapes and life's simple pleasures movingly celebrate the achievement of calm contentment. Aaron's uncanny ability to convey the emotional workings of his protagonists allows the reader a truly visceral experience. It's almost painful to make the transition from one story to the next, as if one is saying goodbye to a dear friend whose deepest secrets you have shared. But then the author does it again…I was left with feelings of longing for all of these characters whose lives had touched mine and also with a deep sense of gratitude for having learned something from them.